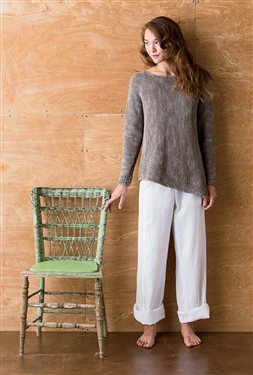 A chunky-but-lightweight chainette yarn gives drape and swing to an oversized shape. A wide boatneck and asymmetrical hem are fun to knit and easy to wear. FINISHED SIZE 41 (46, 50, 53 1/2 57 1/2, 61)" bust circumference. Pullover shown measures 46", modeled with plenty of ease. YARN Berroco Karma (100% cotton; 66 yd [60 m]/1 3/4 oz [50 g]): #3405 burnt umber, 12 (14, 15, 18, 19, 20) skeins. NEEDLES Size 11 (8 mm): 29" circular (cir). Adjust needle size if necessary to obtain the correct gauge. NOTIONS Markers (m); stitch holders; size L/11 (8 mm) crochet hook. GAUGE 12 sts and 19 rows = 4" in rev St st.